Learn How to Mend Your Clothing - DIY and Save Money! Mending your clothing does not have to be a huge project. You can learn simple mending techniques. Our clothing costs too much to throw it away when we rip a seam or break a zipper. Learn how to mend seams, replace zippers and more by following these links to the repair information you need to mend your clothing. 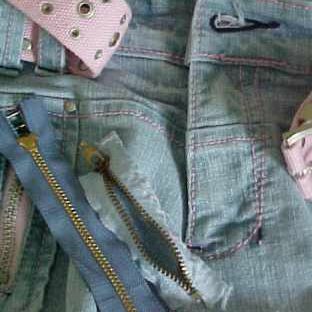 You broke the zipper in your favorite pair of jeans... your options... close them with safety pins or replace the zipper. Replacing the zipper may take more time than safety pins but a replace zipper will look a LOT better! Learn how to replace a jeans zipper and restore your favorite jeans. Your goal when you mend a seam is to restore it to its original condition. This information will guide you through how to mend a seam that is pressed open when it is intact. Jeans have a visible hem which can be reproduced at home so that your jeans are the length you want not what is available at the store! These steps will guide you through everything you need to know to make the process simple! Belt loops rip off jeans because they are tugged on or because too much is hung on them and they usually leave behind a tattered hole in the fabric. These directions will show you how to repair the hole and reattach the belt loop so it is as good as now... maybe even better than new. When you want to make a garment longer, many times you are going to find a faded wear line where the original hem was folded up. There are ways to work with that wear line and still lengthen the garment. You'll find multiple ideas here. You can mend without a sewing machine and without hand sewing. a Tear in the middle of fabric can be repaired if it is caught before it is washed. Learn how to mend torn fabric here. What is fusible web? Learn how this option can save you time to mend almost anything... seams and hems are the first things to jump to mind when using fusible web to mend clothing. You don't need a sewing machine or a needle and thread when you mend with fusible web. You just need to know how they work. A basic sewing kit will have almost everything you need to mend your clothing. Learn what basic sewing supplies are in a basic sewing kit and you'll be ready to mend almost anything. A good shirt can cost over a hundred dollars. Don't throw it away when only parts of the shirt are worn out. Learn how to replace cuffs and repair worn elbows here. You can mend even if you don't have a sewing machine. Learn to hand sew with the information provided in this article. Your sewing machine may be able to sew on flat buttons but hand sewing is usually the quickest method for one or two buttons. A shank button is going to be hand sewn... there is no getting around it. Learn how to make sure the button stays on the garment.